Banned by the record label. Well, one song, anyway. The closest we'll ever come to another "430 N. Harper Ave". Out-takes and early performances, plus "Cuba", the song that broke hearts, promises, and my bank account. This one feels like an old show. O.K. kids, here it is. Hot off the press. You wanted more acoustic stuff. you wanted more songs that sound like they (a'hem) almost made 430 N. Harper Ave. And you wanted to hear Cuba. Well, here you go! What's that? You say you always wondered why some songs I've played live over the years never made it onto a CD? It's because sometimes the mood to record it would pass, and all that was left was a (sometimes very) flawed take. So here you have five or six tracks that I NEVER would have let out there, except that some of you are so charming that you've made me think that anything I ever recorded is worth listening to. Now, I know that's not the case, but after going through a bunch of stuff, I've selected these songs - they seem like a pretty good listen for everybody. There might be one silly song too many, or one lyric too few, the few friends I've tried it out on report many listens in a row and a peaceful feeling overtaking them.... BELIEVE! I'm kidding. I'm a kidder. 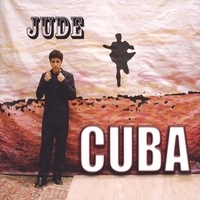 This CD has CUBA, one of the few best songs I'll ever write. Banned by the record label and lost to the Warner vault for all time, this is the only extant mix of the song. I loved it totally dry, but here it is with a little 'verb, etc. So. Please buy this CD and support my artistic lifestyle Or buy two and support me while giving a friend the musical equivalent of a hug and then a little jumping up and down together. Because I'm told that's what it is... Or buy TEN and whimsically open up a music store in your neighborhood. Oh, you'll go broke in time, but not before you've made all kinds of new friends and heard tons of cool music. Plus, some bands will come by and give you free t-shirts and stuff. And maybe the quiet guy from the sandwich shop next door - or the girl who works across the street whom everybody wonders about because she's so pretty but never talks to anyone and seems a little sad - will start dropping by for little talks. Then maybe start bringing sandwiches by and having lunch with you on the counter by the register. And more sweet stuff like that, until one day you end up in a crazy make-out session in the front of the store. Then that'll probably be weird for a little while. Or maybe it'll be awesome and the start of your new life together. It's your choice, really. Music changes everything.